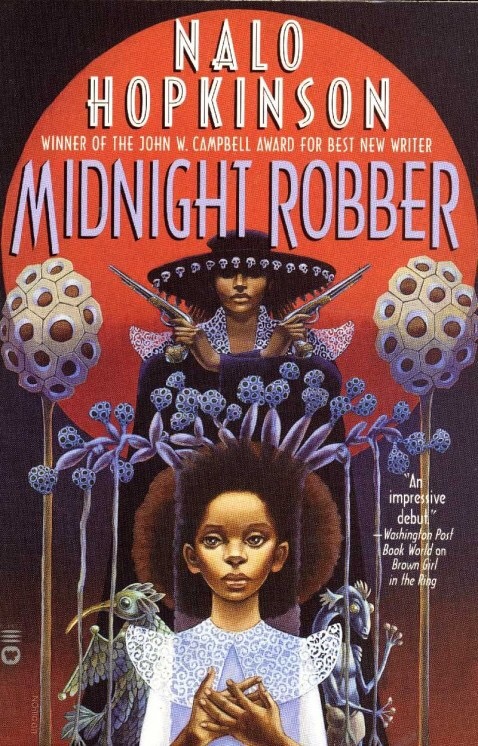 A review of Nalo Hopkinson’s “Midnight Robber” (Warner, 2000). Nalo Hopkinson’s “Midnight Robber” is a narrative about home, memory, and communication. The planet Toussaint is settled by Caribbean people from earth who honour their history through events like Carnival and who remember the history of slavery in their tales. The travel to Toussaint is celebrated as a different type of crossing – crossing the stars by choice instead of being forced to cross the ocean by slavery and the tales of the people of Toussaint explore the interconnections between these two types of travel that brought them to where they are now. Nalo Hopkinson explores the dangers of travel and the issues that travel creates regarding ideas of home and belonging. She intwines ideas of exile and colonialism, exploring the way that these ideas can intertwine – being removed from one place without choice and displacing people from another. The people of Toussaint send those they view as criminals through a gateway to another world called New Half-Way Tree where their exiled lives interfere with the indigenous population of the planet and displace them. Most of the exiles arrive onto New Half-Way Tree with an assumption that they are better than the indigenous inhabitants, treating them as people who are in the way at best or wanting to eliminate them. When Tan Tan arrives from Toussaint to New Half-Way Tree, she wants to treat the indigenous inhabitants of the planet with respect since Toussaint culture is focused on the idea that there should be no masters and everyone should be treated with respect. Yet, her attempts to interact with the indigenous population mark her as an outsider to both populations. Although Hopkinson situates Toussaint as a Utopia in many ways, creating a society that is based on notions of equality, that is open to different types of relationships, and is a place where people are not subjected to back-breaking labour, she creatively questions the utopia she writes. In order to make way for the human inhabitants of Toussaint, the nanite system the planet uses eliminated indigenous fauna that it viewed as threats to the new inhabitants, causing mass extinctions. Although the nanite system allows people to communicate more readily and have access to information, it also interferes with ideas of privacy and everything on Toussaint is surveilled. Further, when the society views someone as subversive or dangerous, they are sent to New Half-Way Tree, where the egalitarian notions of Toussaint only apply to human beings, not the indigenous population, the Douen and the Hinte. Hopkinson illustrates that the notion of home – especially the notion of home for people in exile – is always complicated. Midnight Robber is a tale about tales, delving into the fuzzy border between reality and myth and the way that memory and who we are always becomes partially mythologized. TanTan becomes partially mythologized as stories about her circulate amongst the populations of New Half-Way Tree and she is integrated with the tale of the Midnight Robber. She hears tales about her that have been turned into myth and story and she both finds herself in these tales and simultaneously discovers that she is uncertain who she is. As people stop believing that she is real, something about her sense of selfhood is also made etherial and unclear. TanTan, like the community of New Half-Way Tree, is unsettled. To discover more about Nalo Hopkinson, visit her website at http://nalohopkinson.com. In Brown Girl in the Ring, Nalo Hopkinson blends urban fantasy and near-future science fiction together in a Toronto environment. She creates a Toronto that has been cut off from the rest of Canada, ghettoised and locked off from the rest of the country and made into a controlled space where entrances and exits from the city are carefully monitored and controlled. Yet, this space of conflicted identity, a Toronto that is searching for its new identity, searching for what it should become from a past that has been conflicted and confused. Toronto’s identity has been cut off from the wider Canadian identity through its rejection, and yet this could be an opportunity for it to find a new identity. Despite its near-future science fictional setting, Brown Girl in the Ring is a space of fantasy, incorporating into it magic, mythic figures, Loa (gods and goddesses of Haitian Vodoun), and visions. Ti-Jeanne is a woman who is conflicted between her Torontonian identity and the rich Caribbean heritage that her grandmother has passed down to her – Caribbean foods, creole, healing herbs, and some elements of vodoun. She has had visions and magical power passed down to her that has attracted the attention of the Loa, the gods of Vodoun and her grandmother, Gros-Jeanne has pointed out that if she denies this aspect of herself, if she ignores the magic, it will over-ride her. If she lives in conflict with this aspect of herself, she will be warring with herself instead of integrating herself and accepting all aspects of her identity. Hopkinson’s Toronto is a place where magic can occur, a place where cultures intersect and assert themselves and where people search for identity and meaning as they see their community in new lights, push for change, and come to find new definitions of home. Her Toronto is not one steeped in one history, but a place where multiple histories intersect, where the visions of diverse people come together to see a more complex, more magical, and more inclusive space. Camille Alexa has dual Canadian and American citizenship. She is the co-editor of the Canadian Superhero collection Masked Mosaic as well as the author of the short fiction collection Push of the Sky. 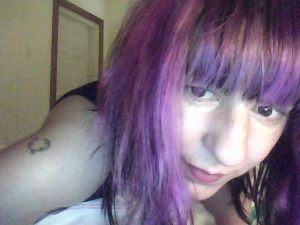 She wrote the winning story for OnSpec’s Apocalypse issue (#90 Vol 24, no 3) and has published in magazines and anthologies such as Subversion, Space & Time Magazine, Imaginarium 2012: The Best Canadian Speculative Writing, Blood and Water, and Chilling Tales 2: In Words, Alas, Drown I. 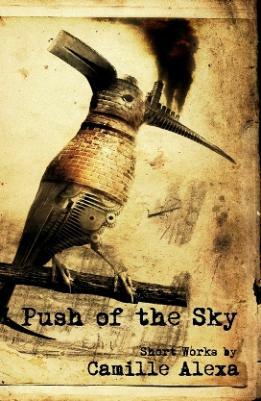 You can explore my review of her story “All Them Pretty Babies” at https://speculatingcanada.wordpress.com/2012/12/29/its-the-end-of-the-world-as-we-know-it-and-i-feel-speculative/ and “Children of the Device” at https://speculatingcanada.wordpress.com/2012/12/01/doomed-to-repeat/ . From the amount of times I have reviewed her work, you can probably tell that I am a fan, so I was quite excited when Ms. Alexa agreed to do an interview with me. I hope you enjoy the following interview as much as I did. Reading her work, you can really tell that, as she says below “My primary aim in fiction is to have a blast writing.” Her love of writing and joy at playing with literary work comes through in the interview below as well as in her fiction writing. Spec Can: I was wondering if you could tell us a little bit about yourself to start off this interview? Camille Alexa: I’m a dual Canadian/ American writer currently riding the rails back and forth between Vancouver, BC and Portland, Oregon. I’ve been told I’m a bit of a contrarian. My hair is not always the same color it was the previous year and a professor once remarked that while my clothes might not make a fashion statement, they certainly raised some fashion questions. I like yams. Spec Can: Several of your short stories have featured an apocalyptic theme. What is the appeal of writing about apocalyptic themes? Camille Alexa: I’ve been pondering this myself. My so-amazing literary agent [Jennifer Weltz of the Jean V. Naggar Literary Agency] recently asked me to compile a list of my published stories for the agency database, each followed by a one- or two-sentence description. There were a few – seventy or eighty – so it took a while, and I was shocked at the kinds of words and phrases popping up again and again: ragtag band of surviving children. . . on the eve of apocalypse . . . land devastated by ecological and biological warfare . . . Some stories hold more conscious humour (“Four Jerks of the Apocalypse,” “A Pretty Lucky Day”), but others tilt toward the raw end of things. I’m not sure why my fiction mind turns to apocalypse so easily, but disaster literature is just so appealing, so rife with opportunity for growth and heroism. New beginnings. Dire endings. That sort of thing. Also, maybe I live in constant fear for the state of the planet? Humans are pretty rough with their toys. Spec Can: What is your favorite apocalyptic theme and why does it interest you so much? Camille Alexa: I’m much less interested in – or for that matter cognizant of – exact themes than I am in characters and the ways in which they react to extreme scenarios. Hey! There’s apocalypse in a nutshell: extreme scenario. About as extreme as you can get, frankly — at least from a human perspective. . . .
Now my fiction brain wants to go off and write stories about the beneficiaries of an apocalypse, those life-forms that’ll thrive and flourish once the rest of us are swept away. Hello, slime mold and cockroaches! Hello, genetically-modified invasive flora! Spec Can: What social issues can apocalyptic themes deal with or raise awareness of? What is useful/worthwhile/important about pondering potential apocalypses? Camille Alexa: My primary aim in fiction is to have a blast writing [author’s note: because writing is awesome!]. My secondary aim is to tell a good story. I’m not trying to teach or preach; if people see something of themselves or their world in a story, recognize something moving or disturbing, then that’s in keeping with the effects of art in general. Cinema, theatre, music, literature — art expands us, makes our private worlds larger rather than smaller, adds to what we’ve felt or seen or experienced up to that point. Spec Can: In your short story Children of the Device (In Here Be Monsters: Tongues and Teeth: Issue Seven, 2012) you deal with a group of human beings who have escaped from the Earth’s destruction and later generations of humanity end up repeating the same self destructive behaviour – over-consumption, mass violence, a focus on the “now”. Where do you see our current social focus on over-consumption and instant culture going? Camille Alexa: Hah! See my answer about the appeal of writing apocalypses. Overconsumption, violence, lack of compassion or fairness, shortsightedness about the future . . . I’ll repeat: humans are rough with their toys. Of course, you could write a perfectly non-apocalyptic story addressing all these themes — it just might not be as much fun. Spec Can: In your short story All Them Pretty Babies (On Spec, Fall issue, 2012), you deal with a post-apocalyptic world in which people with biological differences are only able to thrive in the wastelands outside of the protected city. Could you expand on your commentary about the control and normalising effects of society? What can we learn from your character Esmè, who considers biological difference to be beautiful? Camille Alexa: I’m certainly not anti-society! I think of myself as fairly civic-minded. I recycle and ride a bike and support use of renewable resources. I want society – or should we call it Society, capital S? – to be the best version of itself, honest and just and mighty. Of course, that other stuff you mention – control and normalizing effects – those things sound pretty crummy. Esmè’s story is cool because you get to see the world through her eyes, but also through yours, the reader’s. The intersections of those viewpoints, where they’re dissonant and where they harmonize, is where things get interesting. Spec Can: You currently live in a 2 author house. The creative energy in that house must be amazing. What is it like to live with another author? Camille Alexa: Yes! Though Claude [Lalumière] and I are very careful to give each other space for writing, which is a mostly private endeavour. We’re huge fans of each other’s work, but we do not critique or proof or even read each other’s stories until contributor copies arrive at the house. It can be quite excruciating, waiting on the mail. We love egging each other on, though. Love seeing each other succeed and be read. But it can get emotional. We just received the On Spec all-apocalypse issue with “All them Pretty Babies.” When he told me he liked it, I burst into tears. It’s very powerful thing, knowing someone you respect so much respects you in return. Spec Can: What mythologies influence your work and why do they speak to you? Camille Alexa: My father’s a folklorist, so I’ve always been fascinated with myth and lore. My heritage is Caribbean on my father’s side, Irish and Scandinavian on my mother’s. Since I lived in Denmark for a time, I’d say the Scandinavian history and mythologies speak to me the most, though I love it all. Urban legends and schoolyard lore have always held particular fascination for me, too. Myth taps into things we can’t always justify or explain, moves us or scares us or elates us. Spec Can: What can Speculative Fiction do that ‘realist’ fiction can’t? 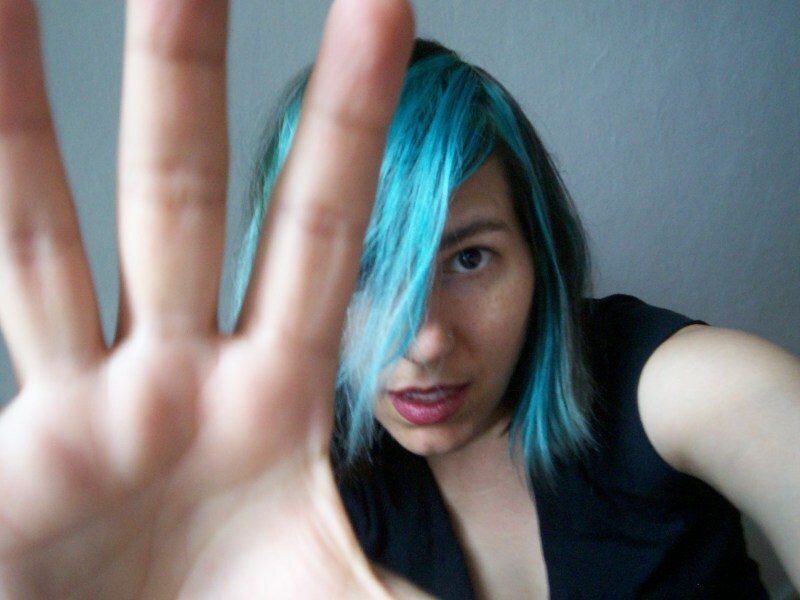 Camille Alexa: What CAN’T speculative fiction do? I think that’s its appeal. You can go anywhere when you untether a story from the probable. With luck, you can get others to follow you to those places you pull from the aether, meet the strange creatures there and tread those weird and unlikely paths. Not all my fiction is speculative. And there are certainly tropes and modes that appeal to me more than others; I’d write a genetically-modified supervirus zombie over a magically animated corpse any day of the week – and it would more likely be tragic than terrifying. Because I’m continually moved and astounded by the natural world, I tend to find inspiration in flora, fauna, specialized ecosystems, early hominids, pterosaurs. . . .
That said, I have absolutely no trouble writing about unicorn shapeshifters or the moon being an enormous wedge of green cheese. I simply treat those things, within the parameters of their own universes, as factual rather than magical. Spec Can: What is distinctive about Canadian Speculative Fiction? Camille Alexa: The Canadian scene feels very exciting right now. The speculative fiction scene in the US seems to have gotten bogged down with a distressing focus on awards and “approved” hierarchies and paths to writerdom. There is no single path to writing, or to loving to write, or to living to write – any more than there is a single path to reading or loving to read. There’s real excitement and energy to Canadian spec fic writing. I was utterly blown away by the incredible stories Claude and I received for our MASKED MOSAIC: CANADIAN SUPER STORIES anthology. As Flash Fiction Editor at Abyss & Apex, I read hundreds of stories from around the world. But that slush pile didn’t hold a candle to the overall quality and inventiveness and sheer excitement of what I read for MM. Not even close. Spec Can: Do your characters ever take you to places that you didn’t intend to go? Do they take on personalities of their own? Camille Alexa: Absolutely! I usually start a story with just a spark. It might be a hint of a character, or a vague idea – even an opening line or a sequence of words. With “All Them Pretty Babies” it was a voice; I simply woke up one day with Esmè’s voice in my head, the way she’d speak and think if she were raised by a mountain woman in a postapocalyptic world with no formal schooling, no society of peers to dictate how and what her grammar or her word choices would be. The voice of the POV character in “After the Pipers” (Triangulation: The Morning After anthology) comes from a similar place, though it’s not got the same cadence or grammatical roots or even plot reasons as Esmè’s. My father the folklorist was an English professor most of my life. Maybe I like disaster stories because they can let me wreak deliberate havoc on grammar as well as on the wider world. I want to thank Camille Alexa for this fantastic interview and for her incredible insights. However, I was really hoping that her hair colour would actually change during the course of our interview 😉 It has been a pleasure talking with her and I really appreciate that she was willing to share insights with readers here on Speculating Canada.